A recipe for cookies with mini chocolate eggs and chocolate chips. 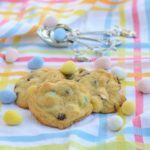 The cookies are a real treat for Easter and spring events. Preheat the oven to 375 degrees F. Line baking sheets with parchment paper or silpat liners. In a medium bowl, add flour, baking soda, and salt. Whisk to combine and set aside. In a large bowl, add butter, sugar, and brown sugar, and beat using a hand mixer on high speed until light and fluffy, about 5 minutes. Add vanilla and eggs, one at at time, beating well after each. Gradually add the flour mixture to the butter mixture, beating at medium speed until just combined. Do not overmix. Stir in the chocolate chips and mini eggs. Use a tablespoon measure to drop dough onto prepared baking sheets. Bake until golden brown, about 9 to 11 minutes. Let cookies cool on baking sheet for 1 minute then transfer to a cooling rack. Repeat with remaining dough. Serve immediately. Store cookies in an airtight container.